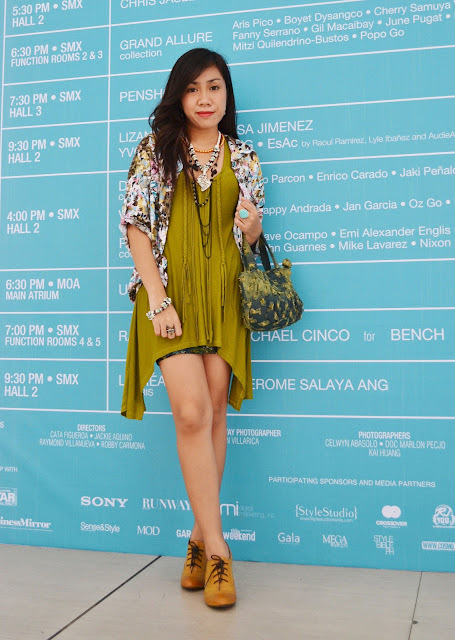 I arrived quite early at SMX Convention Center on the last day of Philippine Fashion Week Holiday 2012. The weather was pretty nice that day and the place was not yet crowded so I took the chance and asked my mom to take my outfit photos right in front of the show schedule. Haha I love how nice the photos turned out! To be honest, I didn't know what to wear on that day. I came home late the night before so I was slightly panicking when I planned this outfit. As usual, I almost emptied my closet. Clothes and accessories were everywhere! Haha Well anyway, I decided to start on what shoes to wear. Since I know that I will be walking a lot on that day because of the different show venues, I chose to wear my comfortable and all time favorite lace up booties. I love that with these shoes, I do not have to sacrifice fashion over comfort! This bag is so cute! It has been sitting on my closet for years (and I mean, years!! I think it's one of the gifts that I received on my debut) already but I never found the opportunity to use it until that day! It may look small but believe me, this bag has super powers! I was able to put all of my things inside (including my 2 phones) and it still looked cute! It went well with my outfit too! So expect to see me again wearing this bag because I feel like overusing it. Haha! You may call it a blouse or a dress, it all depends on how you wear it. And because I'm fun size (LOL), it kinda worked as a mini dress for me. High-low cuts are one of the hottest trends nowadays so when I saw this blouse somewhere within the depths of my closet (haha), I knew I just had to wear it. I love the tassels and fringe too! Très chic! I do not want to look too revealing so I opted to wear a button down as a cover up and a tube top as a skirt (again) so I can move around freely. Why wear one necklace when you can wear three? Accessorizing is the key to making an outfit stand out. Just don't overdo it of course. Know the right colors and designs that would complement your look well. I opted for three necklaces in different lengths to make it look continuous with the tassels and fringe and I believe it made the whole outfit look so put together. Don't you think?